John Morris told of receiving bribes from James Bulger. After days of sitting meekly at his federal racketeering trial, James “Whitey” Bulger erupted in anger Thursday as a former FBI supervisor he had once plied with cash bribes and cases of wine told jurors that the gangster had given information in a case involving his associates. “You’re a [expletive] liar,’’ Bulger, 83, snarled as he glared at his longtime nemesis, John Morris, who seemed nervous and uncomfortable at times as he sat in the witness stand a few feet away. “Yes, sir,” said Bulger, who remained quiet the rest of the day but continued to stare at Morris. Bulger is charged in the sweeping racketeering indictment with participating in 19 murders in the 1970s and 1980s, dozens of extortions, money laundering, and stockpiling guns. The rare display of emotion by Bulger, who has barely glanced at most witnesses, came on the 12th day of testimony at his trial as he faced Morris for the first time since learning he was one of The Boston Globe’s sources for a 1988 Spotlight series that revealed Bulger was an FBI informant. Morris, now 67 and testifying under a grant of immunity, admitted that he took bribes totaling $7,000, cases of wine, and other gifts from Bulger and his partner, Stephen “The Rifleman” Flemmi, and met them for social dinners, including once when Bulger’s politician brother made a brief appearance. He admitted leaking information to the gangsters and their FBI handler that probably led to several killings. But it was Morris’s testimony about Bulger informing on a Revere loan shark victim that hit a nerve with the suspect, who insists he was never an informant. 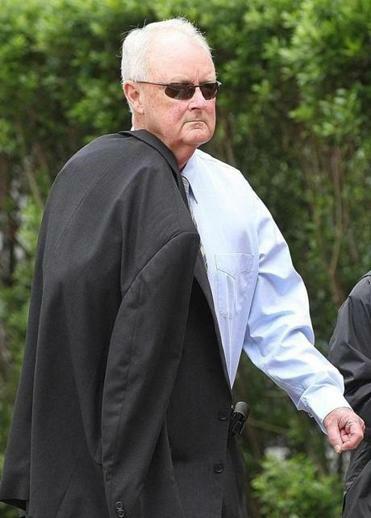 Morris, who worked in the FBI’s Boston office in the 1970s and 1980s and supervised its organized crime squad for six years, said he became friends with agent John J. Connolly Jr., who introduced him to his informants, Bulger and Flemmi. Soon Morris was hosting dinners at his Lexington home for the pair. Bulger and Flemmi gave the FBI information about Mafia leaders, Charlestown drug dealers, and other gangsters, Morris said. He described a dinner at the home of Flemmi’s parents in South Boston that was interrupted when Bulger’s brother, William, dropped by. “He just looked very uncomfortable,” said Morris, testifying that William Bulger, then president of the Massachusetts Senate, didn’t look at the agents or talk to them and left after watching a television show. After Tulsa businessman Roger Wheeler was killed in 1981, Morris testified, he used “bad judgment” by telling Connolly that Winter Hill gang associate Edward “Brian” Halloran was cooperating with the FBI and had implicated Bulger and Flemmi in the slaying. When Halloran was shot to death in 1982, along with Michael Donahue, who was giving Halloran a ride home, Morris let Connolly file a false report claiming that Bulger and Flemmi didn’t know Halloran was cooperating, Morris said Thursday. The following month, Morris testified, he asked Connolly to get $1,000 from Bulger and Flemmi to buy an airline ticket for Morris’s girlfriend so she could join him at a conference in Georgia. By then, Morris said, “I knew that I was clearly compromised.” In 1984, he took another case of wine with $1,000 tucked in the bottom from Connolly, understanding it was a gift from Bulger and Flemmi. Morris was suspended for two weeks for talking to the Globe but later was promoted to assistant special agent in charge of the FBI’s Los Angeles office. Bulger, who was captured in Santa Monica, Calif., two years ago after 16 years on the run, called Morris in 1995, demanding that he get the Globe to retract its report, Morris said. Later, Morris suffered a major heart attack. He retired from the FBI that year and now works as a wine consultant and volunteers at a soup kitchen, he said. During cross-examination, Morris admitted to a history of lying. He also admitted that he was so eager to coerce a potential witness into cooperating in the 1970s that he planted a fake bomb underneath his car, to instill fear. The trick did not work. Jurors also heard from Paul McGonagle, the son of alleged Bulger victim Paul “Paulie” McGonagle. Now 53, he told jurors that he was 14 when his father disappeared in 1974. A year later, Bulger told him they “took care of the guys who got my father,” McGonagle said. His father’s remains were unearthed in 2000 from a grave at the edge of Tenean Beach in Dorchester. Shelley Murphy can be reached at shmurphy@globe.com. Milton J. Valencia can be reached at mvalencia @globe.com.